Not that long ago they decided to buy some wax and buy some scents and post a picture of our candle on the internet. Little did they know it began the start of what is now known as Wicked Women Inc.
A mother and a daughter thought they could make a go at this idea of making candles so that is what they did. Tanya Jones Smallwood and her mother Sue M. Jones began that American dream of running their own business with the view of becoming big. When the road began they figured they would be making some candles here and there and now they are producing them everyday of the week. 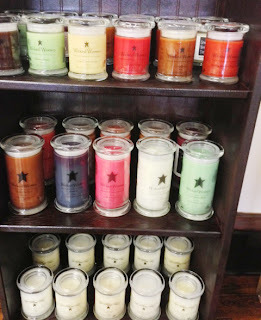 Not only did they expand on their candle line they began making their own Americana rustic décor. These items are refurbished barn wood, house windows, tables and anything that is old that is brought to new. These items would be maybe thrown in the trash but they transform them into items of beauty for your country rustic home. All of this happens right at home. These women are a duo that not only do they help their own business but they additionally help other women who want to feel the freedom of working from home and running their own business. Join the ride down the road with them by getting to know their product and what they have to offer for you and your home.